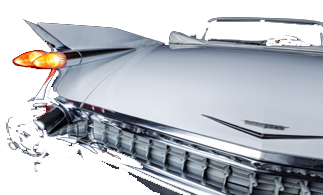 Our Matching Fleet of White 1959 Cadillac Convertibles and Sydney's only Super Stretch 1959 Cadillac Limousine will provide a timeless backdrop with exceptional service beyond your expectations making it a 'picture perfect' and memorable day. If it is classic car hire you are after, we have one of the most impressive fleets of Cadillac wedding cars nationwide. The selection available includes Sydney's only matching fleet of 1959 Cadillac's. A very unique set of 1959 Cadillac convertibles and a 10 passenger super-stretch limo, the likes of which you won't find anywhere else in Australia. If you need classic car hire for your formal event, the fleet at Ace American Convertibles provides a combination of comfort and style that is unparalleled by any company in the area. Ace American Convertibles is great if you just need vintage bridal car hire or if you want a whole fleet of classic wedding cars for the entire wedding party. These classic cars and limousine are available for hire for a whole range of events and occasions in Sydney. Guaranteed to make all heads turn as you cruise by in these meticulously maintained, original classic cars. For further information you may contact Ace American Convertibles for a tailored quote to suit your personal needs and arrange an appointment to view the cars to discuss your special day. You will be pleasantly surprised by our prices and service.